Hybrid rye has similar concentrations of digestible amino acids and greater digestibility of phosphorus when compared with corn and an intermediate concentration of metabolizable energy when compared with barley and corn. Historically, rye has not been fed to pigs in large amounts due to concern of ergot contamination and the high prevalence of pentoses in the fiber fraction of rye, which are considered to be antinutritional factors in young animals. However, with the advent of new hybrids of rye from KWS Lochow GMBH (Germany), rye production has increased in Europe, and the market is beginning to grow in North America as well. In field trials over the last few years, hybrid rye has been shown to out-yield other small grains, including wheat, barley, triticale and old-type rye. The winter crop offers superior tolerance to cold and drought than other grains, making it suitable for land with poor soil conditions as well. Through breeding efforts, the new hybrids have also been developed to mitigate some of the risk of ergot infection by selecting for genes that increase pollen production, thereby reducing the opportunity for ergot to infect the plant — which is good news for the feed industry. As a feed ingredient, hybrid rye is similar to barley and wheat when considering its starch, protein and fiber content, and it has been used with success in diets for pigs in Denmark, Germany and Poland in recent years. It is expected that more producers in the United States and Canada will start adding rye to their formulations as the production of hybrid rye grows. It has been the objective of recent research to determine the nutritional value of hybrid rye in comparison with other commonly used cereal grains, including barley, wheat, corn and sorghum. Thus far, a series of three experiments have been conducted to determine the nutritional characteristics of rye that are essential for accurate diet formulation. In this research, values for the standardized ileal digestibility of amino acids, the standardized total tract digestibility of phosphorus and the concentration of metabolizable energy were determined. The first experiment tested the hypothesis that hybrid rye provides quantities of ileal digestible crude protein and amino acids that are comparable to values obtained in barley, wheat and corn. Two hybrids of rye that were grown in Germany — Bono and Daniello — and one hybrid of rye that was grown in Canada — Brasetto — were used in the study, along with barley, wheat and corn that were grown in the United States. The crude protein was greatest in wheat (11.4%), followed by barley (10.5%), Daniello rye (9.1%), Brasetto rye (8.9%), Bono rye (8.7%) and corn (7.2%; Table 1). Table 1: Analyzed nutrient composition of three sources of hybrid rye, barley, wheat and corn, as-fed basis. In growing pigs, the SID of crude protein was significantly greater (P < 0.05) in barley, wheat and corn than in the three hybrids of rye, and this was also true for the SID of lysine, methionine, threonine and tryptophan (Table 2). Despite the lower SID of crude protein and amino acids observed in hybrid rye compared with the other grains, the concentrations of standardized ileal digestible crude protein and amino acids were similar in hybrid rye and corn. Table 2: Standardized ileal digestibility of crude protein and amino acids, and concentrations of standardized ileal digestible crude protein and amino acids in three sources of hybrid rye, barley, wheat and corn. The reason for this observation is that hybrid rye contains more amino acids than corn, so when the concentration of each amino acid is multiplied by the digestibility value, corn and hybrid rye will provide the same quantities of digestible amino acids to the diet. The second experiment tested the hypothesis that the STTD of phosphorus in hybrid rye is greater than in corn, barley, wheat and sorghum, and that addition of phytase increases the STTD of phosphorus in all cereal grains. Fourteen diets were used in the experiment, and each cereal grain (Bono rye, Daniello rye, Brasetto rye, barley, wheat, corn and sorghum) was used in two different diets — one diet containing no microbial phytase and one diet containing 1,000 FTU microbial phytase. The STTD of phosphorus in the three hybrids of rye with microbial phytase was 75.3%, 67.8% and 65.1%, respectively (Table 3). The STTD of phosphorus was greater (P < 0.001) in Daniello hybrid rye with microbial phytase than in all other cereal grains except barley with microbial phytase. Table 3: Analyzed mineral content, intrinsic phytase, and standardized total tract digestibility of P in three sources of hybrid rye, barley, wheat, corn and sorghum, as-fed basis. Among the diets containing microbial phytase, there was no difference in STTD of phosphorus among barley, Bono hybrid rye, Brasetto hybrid rye and corn. 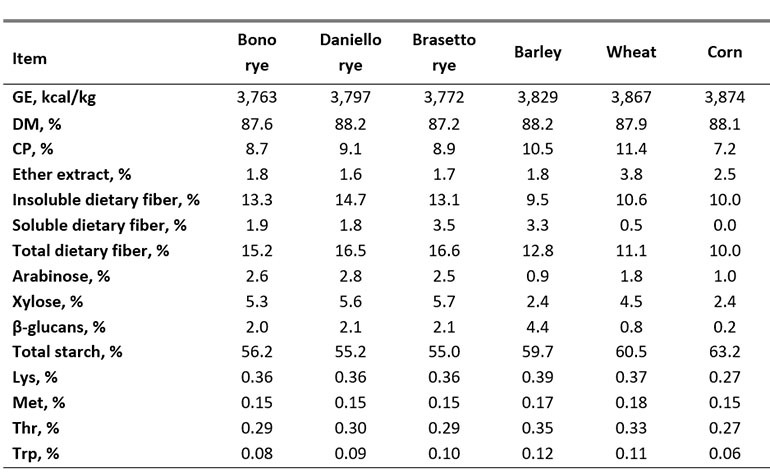 Among the diets that did not include microbial phytase, the Bono and Daniello hybrids of rye had greater (P < 0.05) STTD of phosphorus than wheat, barley, corn and sorghum, which is likely a result of the greater intrinsic phytase activity in rye than in the other cereal grains. The three hybrids of rye had intrinsic phytase activities ranging from 2,300 to 3,200 phytase units per kilogram. In comparison, the intrinsic phytase activity of wheat and barley was 580 and 490 phytase units per kilogram, respectively, and corn and sorghum both had less than 100 phytase units per kilogram intrinsic phytase activity. The third experiment tested the hypothesis that the digestion and fermentation of carbohydrates in rye will yield similar digestible and metabolizable energy as barley and wheat. Two hybrids of rye were used in this experiment, one of which (Bono) was grown in the United States, whereas the other hybrid (Brasetto) was grown in Canada. As in the previous experiment, hybrid rye was compared with barley, wheat, corn and sorghum. The gross energy was greatest in barley (3,974 kilocalories per kilogram), and the GE in the other grains ranged from 3,824 kilocalories per kilogram in corn to 3,870 kilocalories per kilogram in wheat (Table 4). The crude protein was observed to be slightly higher in the hybrids of rye used in this experiment (10.8% and 9.3%) compared to the previous experiments. Barley contained the least total starch (51.7%), whereas sorghum contained the most (62.3%), and the two hybrids of rye contained intermediate amounts of starch (56.6% and 54.9% in Bono and Brasetto, respectively). Table 4: Analyzed nutrient composition, apparent ileal digestibility of starch, apparent total tract digestibility of gross energy, and ME concentrations in two sources of hybrid rye, barley, wheat, corn and sorghum. The apparent ileal digestibility of starch was greater than 90% for all cereal grains tested, and the apparent total tract digestibility of starch was greater than 98% for all grains. The ATTD of GE was greatest (P < 0.05) in corn and wheat and least in barley, whereas the Bono and Brasetto hybrid rye had intermediate values of 85.3% and 84.6%, respectively. The DE and ME were also greatest in corn and least in barley. On a DM-basis, the concentration of ME in Bono and Brasetto rye was 3,495 kilocalories per kilogram and 3,471 kilocalories per kilogram, respectively. Additional results from this experiment will be available by the end of this year. The results are expected to elucidate more information about the digestibility and fermentability of fiber in hybrid rye, which will give further insight to the overall nutritional value. In the next few years, the results from these digestibility studies will be used to formulate diets for several more experiments that will focus on production parameters. Thus, future experiments will investigate effects of hybrid rye on sow reproductive performance, as well as on growth performance in piglets, nursery pigs and grow-finish pigs.